Clinical practice guidelines and patient decision aids are knowledge tools designed to facilitate evidence-based/evidence-informed decision making. However, the processes of developing and evaluating these knowledge tools can also serve as an effective integrated knowledge translation strategy because they require active collaboration among methodologists, content experts, and knowledge users. Evidence-based clinical practice guidelines are knowledge tools defined as systematically developed statements aimed to assist in making decisions about appropriate health care for specific clinical circumstances. How are clinical practice guidelines developed? Completing an external review of the draft report among intended users and key stakeholders. 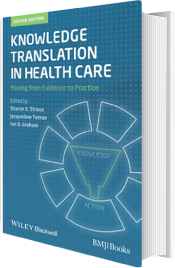 *For more details on developing clinical practice guidelines, please refer to the full publication “Knowledge Translation in Health Care: Moving from Evidence into Practice” (2013). Do clinical practice guidelines work? The impact of clinical practice guidelines on practice and outcomes is complex. Systematic reviews and studies by Grimshaw and others suggest that interventions to implement clinical practice guidelines, or similar statements, can influence both the processes and the outcomes of care, although the effect sizes tend to be modest. The potential benefits of clinical practice guidelines are only as good as the quality of the guidelines themselves. There is good evidence demonstrating that guidelines can facilitate system and policy decisions. While adherence to evidence-based principles is important, other factors believed to influence guideline uptake include adopters’ perceptions of the guidelines characteristics and messages, perceptions of the development process, and factors related to norms and context. How do we determine the quality of clinical practice guidelines? In reality, the quality of clinical practice guidelines can be extremely variable and often falls short of basic standards. In response to this challenge, the AGREE II instrument was designed to evaluate the process of guideline development and the quality of reporting. The AGREE II instrument is composed of 23 items targeting 6 quality domains, one global rating scale, and a user’s guide. At minimum, four people are required to assess the guideline using the AGREE II instrument. *For more detail on clinical practice guidelines, please refer to the full publication “Knowledge Translation in Health Care: Moving from Evidence into Practice” (2013). Patient decision aids are interventions and/or tools that are designed to translate evidence into tools that at a minimum, a) make explicit the decision to be made; b) inform patients about their options; c) help them clarify the value that they place on benefits versus harms; and d) guide them in the process of decision making. Formats for these tools include paper-based booklets, video/DVDs, decision boards, and Internet-based materials. Patient decision aids are used as adjuncts to practitioner counselling for decisions where the best choice depends on how patients weigh the benefits, risks and scientific uncertainty. How are patient decision aids developed? Do patient decision aids work? A review of 10 systematic reviews of patient decision aids showed that these knowledge tools improve patients’ participation in decision making, knowledge of options, and agreement between patients’ values and the subsequent treatment or screening decisions. However, their impact on clinical outcomes is less clear. Finally, there appears to be a positive effect on patients’ communication with their health practitioner and mixed results on the time required for this consultation. How to determine the quality of patient decision aids? The IPDAS Collaboration was established to reach agreement on criteria for developing and appraising the quality of patient decision aids. The IPDAS checklist has domains that include a) content; b) development; and c) evaluation. *For more information on patient decision aids, please refer to the full publication “Knowledge Translation in Health Care: Moving from Evidence into Practice” (2013).